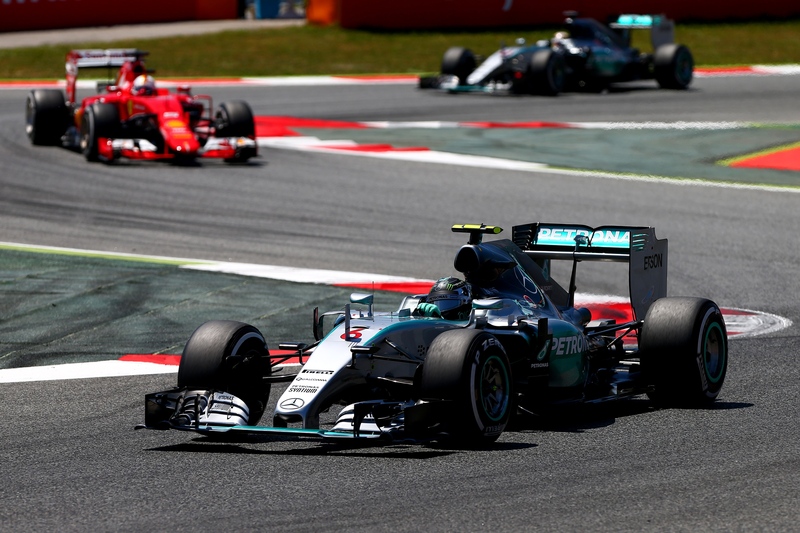 Nico Rosberg has won the 2015 Spanish Grand Prix from pole position after a poor start for Lewis Hamilton put the reigning champion at a race-long disadvantage. Hamilton was stuck behind Sebastian Vettel for the first half of the race before electing to switch strategies to try and ensure himself 2nd place. In the end, the switch paid off, with Hamilton able to jump Vettel. By which time, Rosberg was too far out of reach.The win is Rosberg’s first since last year’s Brazilian Grand Prix, with Hamilton now holding a 20 point lead over his team-mate heading into the Monaco Grand Prix in a fortnight. Nico Rosberg had successfully ended his team-mates run of pole positions in yesterday’s qualifying sessions; and at a track where the pole position man has won on more occasions than any other, it was crucial for the German to get a good start. Thankfully for Nico, he did. His team-mate on the other-hand had a little touch of wheel-spin which allowed both Vettel and Bottas a sniff of opportunity. 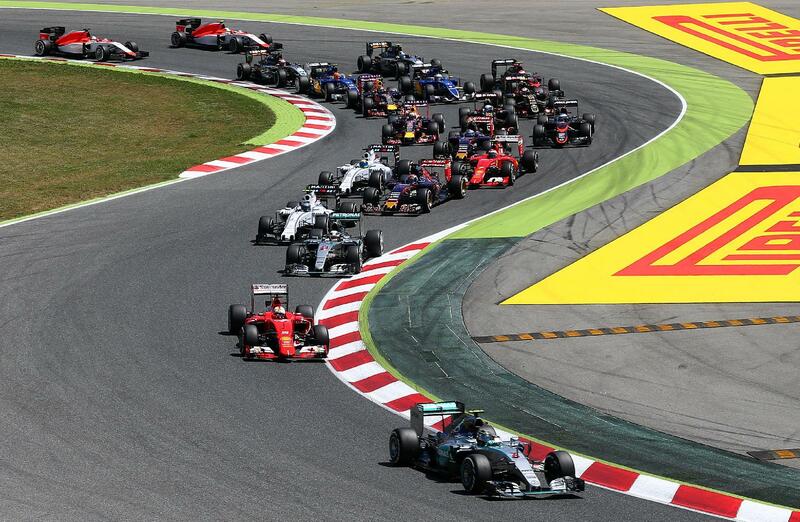 Vettel pulled off a move on the Briton to take 2nd, but Hamilton was able to just hold the Williams of Valtteri at bay. Kimi Raikkonen was also making gains in the second Ferrari as he jumped the two Toro Rosso’s to take 5th. The rookie line-up in the Red Bull junior team had impressed in qualifying after locking out the 3rd row of the grid, but the Toro Rosso seemed to have rather poor race pace; particularly on the long start/finish straight. After just 10 laps, Verstappen was down in 7th, with Sainz outside of the top 10 after Massa, Maldonado, Ricciardo and Grosjean all out-dragged them with the help of DRS. Whilst the rookies were falling through the field, Hamilton was still stuck behind Sebastian Vettel. As had been the case in Shanghai, the turbulent air experienced when closely behind another driver was proving to be problematic for Hamilton; who claimed over the radio that it was ‘impossible to get close’ to the Ferrari. Mercedes elected to attempt the under-cut on Vettel by pitting a lap earlier, but the left-rear tyre was difficult to put back on the #44 car. This led to a costly 5.3 second stop that allowed Vettel to keep the place. Another long stint behind Vettel followed for Hamilton, with Lewis telling his engineer that it was pretty much impossible for him to attack the Ferrari driver. He feigned moves to the inside of turn 1 on multiple locations, but the Silver Arrow would fall back in the middle sector thanks to prevalent under-steer due to the turbulent air. Rosberg was now 9 seconds ahead, so Hamilton had to try a new strategy. The team elected to box Hamilton early for the mandatory hard tyre stint; thus switching Lewis to a 3 stop strategy as opposed to the 2 stop strategy for Rosberg and Vettel. Ferrari decided not to cover off Hamilton by pitting Sebastian, thus meaning that after a few blistering laps by Lewis, Vettel would now fall behind when he next stopped. This proved to be the case on lap 40 out of 66 when Vettel made his final stop for hard tyres and rejoined a few seconds behind the Mercedes driver. Rosberg pitted for his final stop on lap 45, which gave the lead temporarily to his team-mate who was still yet to make his 3rd and final stop. This stint was all about Lewis putting in good enough times so that he could pit and re-join ahead of Vettel. Hamilton managed to set a number of fastest laps before making his final stop for medium tyres on lap 51; when his engineer informed him that he now had enough time in hand over the #5 Ferrari. Rosberg now had the lead by 20 seconds with 13 laps to go, but Hamilton wasn’t content with settling for second too easily. Hamilton was advised by his team that the win was perhaps out of his reach, to which Hamilton asked if it was impossible. His engineer Bono said it looked that way, but nevertheless, Lewis kept pushing on as he set the fastest lap of the race, a 1’28.270, on the next lap. He cut the gap down to 12 seconds before he started to ease off. Nico Rosberg had been under-fire by critics during the start of this season for lacking the pace and possibly the mind-set to challenge his team-mate for the championship. 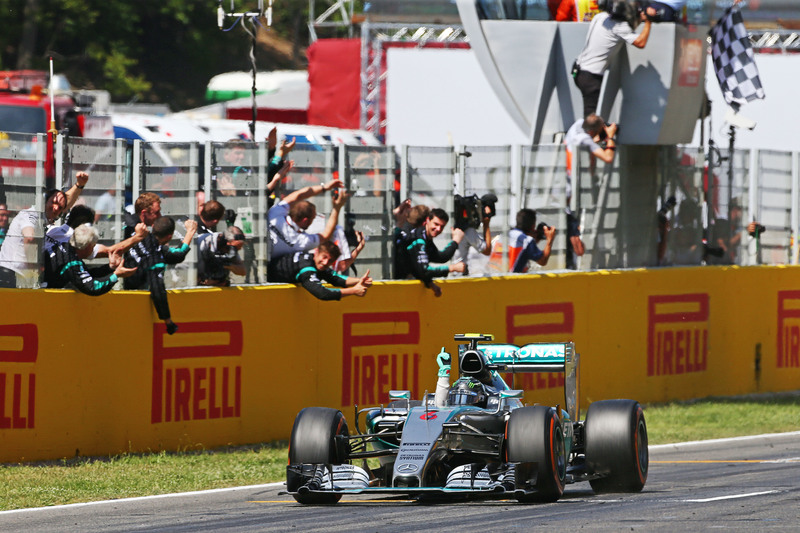 The Spanish Grand Prix was seen as a ‘must-win’ for Nico in order to turn his chances around and that he did. Nico crossed the line on lap 66 to take his first victory of the year, with team-mate Lewis Hamilton coming home 15 seconds behind him to take his 12th consecutive top 2 finish. Sebastian Vettel hadn’t had the race he had hoped for. In the first half of the race he was more than capable of holding Hamilton behind him, but a poor choice by Ferrari not to cover Hamilton’s strategy switch denied the German a chance to keep 2nd place. He crossed the line to take his 4th podium finish out of 3 races. Formula One’s two Finnish drivers finished just off of the podium in 4th and 5th, with Valtteri Bottas holding off a late race charge by Kimi Raikkonen. Felipe Massa followed his former team-mate to take 6th place, with Daniel Ricciardo taking yet another sub-par result in 7th place for Red Bull. Romain Grosjean took 8th place despite a difficult pit-stop that saw the Frenchman over-shoot his pit-box and collect his front jack-man. The jack-man wasn’t too badly injured, with the team quick to provide an ice-pack after some rather uncomfortable contact to a rather personal body part… It wasn’t a good day to be a jack-man, with Fernando Alonso’s pit-crew member narrowly avoiding being sent flying after the Spaniard lost his brakes due to an errant visor tear-off. 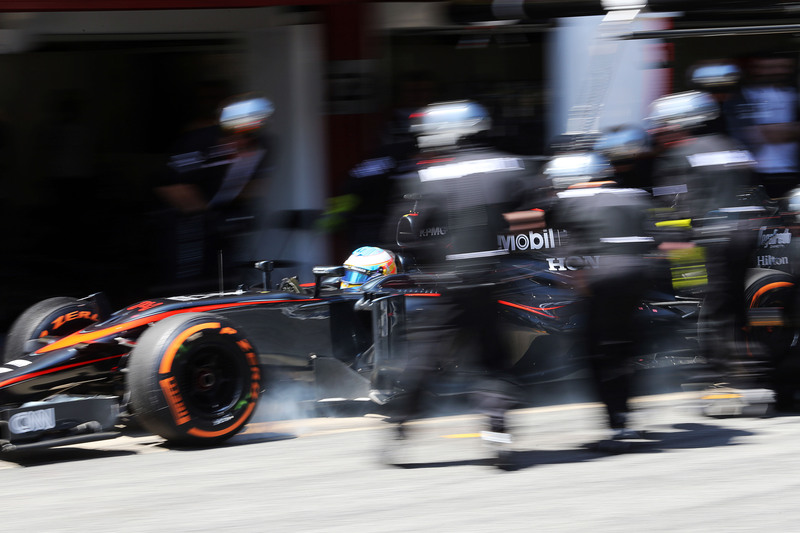 The team then chose to retire the car; a disappointing end to Alonso’s home race. Carlos Sainz and Daniil Kvyat rounded out the points paying positions for Toro Rosso and Red Bull, with the pair making contact at the start of the final lap into turn 1. Sainz was trying a move around the outside of the 2014 Toro Rosso driver, but the Russian locked-up on the inside and made small contact. Sainz elected to take to the run-off area and re-joined ahead of Kvyat at turn 3. Sainz was later put under investigation by the stewards for track-limits, with the likelihood being that the positions will be switched. Pastor Maldonado joined Fernando Alonso in retirement after having fairly good pace at the start of the race. The Venezuelan had made contact with his team-mate in the opening two laps, leaving his rear-wing flapping slightly. Rather than replacing the wing, the team chose to simply break off the broken part and send him on his way again. The team later asked him to bring the car back to the pits and retire. Rosberg’s victory means that he has closed the gap to his team-mate to 20 points in the drivers’ championship heading into round 6 in Monaco. Mercedes further increased their lead in the constructors’ championship; 70 points now the margin between the Silver Arrows and Scuderia Ferrari.